We’ve been hard at work figuring out the strategies and tools that help small businesses succeed on social media, and we want to share that information with you! Sprout Social’s SMB Sales reps to uncover the most valuable tools, solutions, and workflows for SMB marketers. Sprout’s Success team to find out what trips up small businesses when getting started with social marketing. 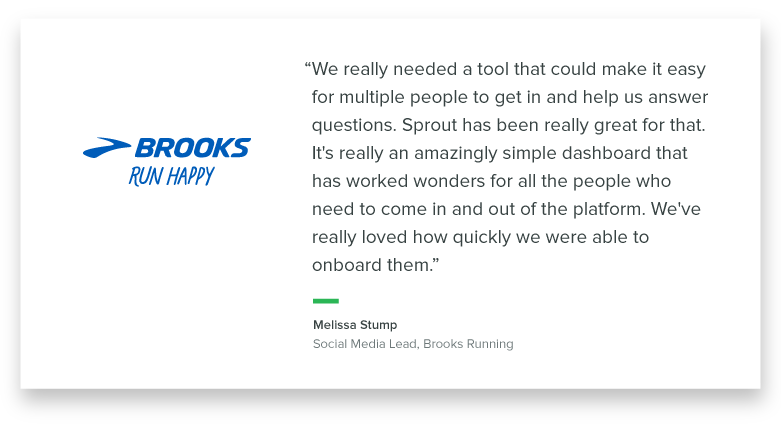 Sprout’s customers to find out what their main goals are on social media and the workflows that drive the most success. Whether you’re new to social media marketing or a social veteran, you’ll find what you need here. Just use the table of contents to navigate to your preferred content. While this guide focuses on small business social media, see our new guide if you’d like to take a step back and learn all things small business marketing! Working at a smaller organization you’re probably wearing more hats than a Doctor Seuss character (or maybe that was just Cat in the Hat…). I was astounded to hear just how much most small business marketers have on their plates, like Stephanie from the McFerrin Center for Entrepreneurship. I’m the jack of all trades for the entrepreneurship center. Whether it’s basic graphic design, social media or press releases, anything that has to do with communications marketing and social media falls under me. Whether you’re at a scaling startup and handle all of the marketing or a local business trying to manage social while also managing the books, there doesn’t seem to be enough time in the day to prioritize social media. But if we look back to the amazing Stephanie, that doesn’t discourage her from fully leveraging social media. I really love social media. I know a lot of people have issues with it, but I think it’s really fascinating. It’s definitely a passion, but it can be easy to forget about when you’re busy doing other things. Social media is valuable for businesses of any size or industry, and finding customers on social media has a direct impact on sales and your bottom line. 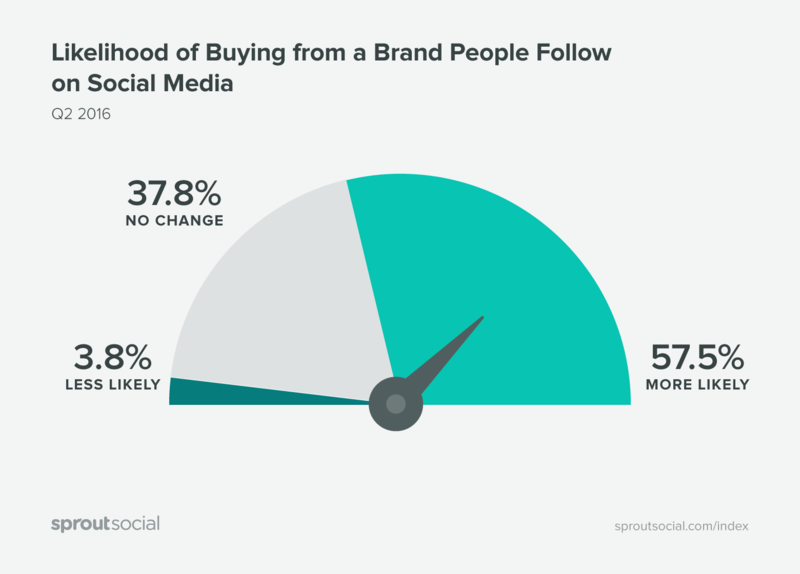 Take a look at how much more likely individuals are to buy from the companies that they follow on social media channels. While finding and keeping customers is a challenging endeavor, it’s equally if not more important to maintain and build relationships with the customers that you already have. Any missed opportunities or poor customer experiences can spread through your client-base like wildfire, leading to churn that can cost you the business you’ve worked tirelessly to build. These missed opportunities and poor customer experiences are especially dangerous if you’re not active and engaging on social as a business, because they’re invisible to you until it’s too late. Not only that, but the number of social users willing to buy from you skyrockets if you use social media not just for publishing, but for actually engaging with your social media audience. But how exactly can you get social media users to purchase from you and increase the value of social for your small business? Try these proven tactics. The proof is in the pudding; social media is a key channel for growing revenue for your small business and should be prioritized. But while social media is great for sales, there is so much more you can do. Let’s dive into the next section: Setting social goals for your small business. I’ve spoken with many marketers doing amazing work on social media who don’t know how to prove that what they’re doing is having an impact on the business. Almost every time this stemmed from simply not knowing how to choose goals. Setting the right goals will not only help you prove your success, but also help you figure out which tactics are working. This makes it much easier to scale your social media presence. But choosing goals can be tough. So here are three different ways to hone in on the goals based on where you want users in the funnel, what your peers are doing, and by the industry that you’re in. I can’t say this enough: the goal of your social media marketing should never be to simply bulk schedule and blast out posts. The social networks don’t reward you for a publishing-only strategy and neither do your customers. 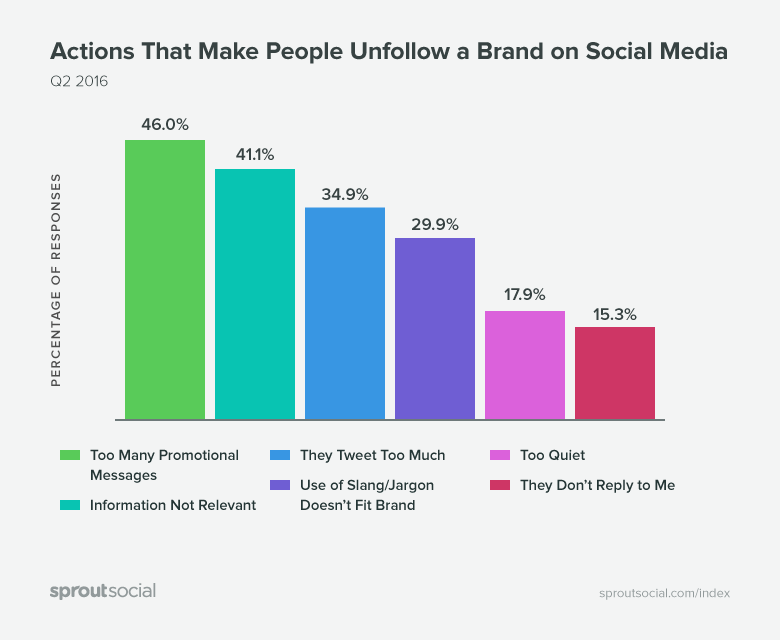 In fact, being too promotional is the number one reasons consumers will unfollow you on social. Instead, you can look at your social media presence from the funnel perspective. Yes, you need to publish content to drive awareness, reach and overall brand awareness. But it doesn’t stop there. The further down you get in the funnel, the more important it is to actually respond to your customers and create great relationships. 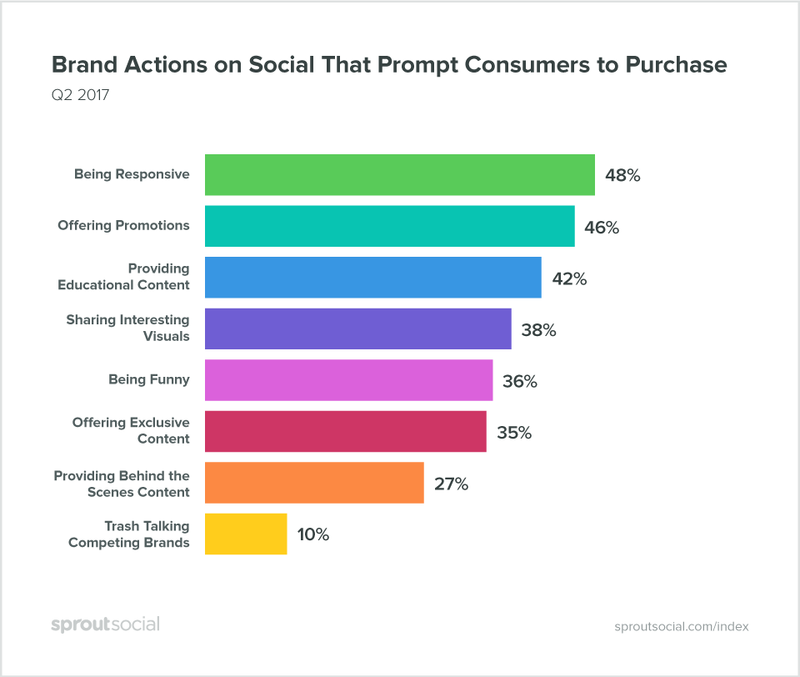 This idea of engaging with your social media followers across every step of the funnel is paramount at Sprout Social, where we believe that Open Communication Creates Progress. It seemed like Sprout was more interested in audience engagement and how to optimize engaging with your audience rather than just posting. No matter which steps of the funnel you optimize for, make sure that you’re listening and responding to your customers at every stage of their journey. While the funnel is an amazing place to start choosing your goals, you can also look to your peers in the social marketing space. It’s important to know that whenever you’re feeling overwhelmed or frustrated with social media marketing, there are people out there facing the same challenges you are. 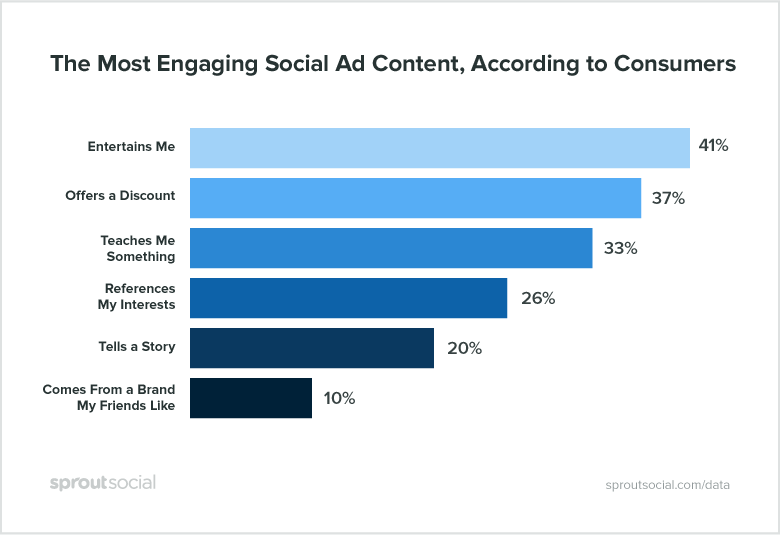 The most recent Sprout Social index asked marketers what their biggest goals are on social media. If these goals seem to align with your own, then make sure to keep track of them, as well! At Sprout, we’re lucky enough to work with thousands of small businesses in any industry you can name. We’ve helped these customers set their social goals based off of the ways they can succeed, and you can leverage those insights for choosing your own goals. Whether you’re managing the social media marketing for your entire institution, or a single department within a college, these are some of the goals that will ensure you’re making a valuable impact. 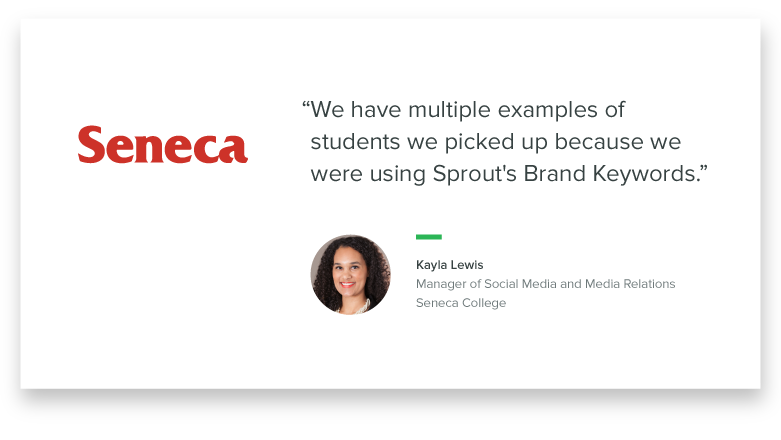 While it may seem wild to think that you can do so much with social, our client Seneca College created a strategy that helped them actually recruit new students to attend their university. Internet and Software organizations make up a good deal of Sprout Social’s small business clients, like Trello. Though their business has tremendous brand recognition in the space they still have a smaller team relative to their peers in the SaaS space. Given the high volume of sales in the retail industry, social media can be a goldmine for finding new customers. Brooks Running has mastered the ability to quickly find and engage with customers to increase their sales from social. Healthcare can be a difficult industry to market on social media. There are rules and regulations that must be followed so your organization doesn’t land in hot water. While you establish your goals make sure that you remain HIPAA compliant. For non-profit organizations, audience engagement can be about much more than marketing metrics. We spoke to one organization using Sprout that provided diapers and baby food to families in need, and if they missed any single message on social media it meant that a child could be going hungry. S0 while you look to these goals as a guiding light, remember to take into account your specific organization and the most important things you should be accomplishing on social. While some franchisees may have goals set on at a franchisor level, if you have some leeway when it comes to creating your social goals keep these in mind. Poor customer service or negative reviews can make or break your organization in the travel and hospitality interest. While setting goals to increase your customer base is important, it’s just as important to engage your customers on social channels to ensure the best possible experience. The food and beverage industry has amazing potential to find and delight new customers on social media through social listening. Braxton Brewing is good example. They set up Sprout Social Brand Keywords in their Smart Inbox, found a local celebrity mentioning beer in their area, and sent them a care package, increasing their celebrity influence. Lifestyle and fitness are incredibly important on social media. Not just the lifestyle and fitness models sharing their content, but the brands that supply those celebrities as well. Keeping your products adjacent to those influencers will help keep you top of mind. Here are some additional goals to consider. Finance and credit unions are also susceptible to social media trouble. While you should consider the below goals, also consider what the rules and regulations are for marketing your institution on social media. Entertainment is a big part of social media, and if you can bring some of your entertainment to social media you reap the rewards of increased reach, engagement and sales. Beyond that, here are some of the most popular goals we see on social. Technology has transformed industries big and small around the world, but few have been impacted as much as journalism. While some people may prefer the feel of paper in their hands, the numbers don’t lie: Modern consumers turn to screens for their news. So make sure you’re staying ahead by setting some of these social goals. Social media can have an incredible impact on attracting customers to your attractions. Just set and track some of these social media goals to take your social presence to the next level. Do you need help connecting your goals to your social media strategy? Fill out your information below and one of our specialists will help you figure out how. Now that you have an idea of the goals you’d like to achieve, let’s move on to the next section, Social analytics and reporting for small business, to help you prove you’re hitting those goals. Setting social goals is paramount to finding social success, but you don't have to choose your goals yourself: our team can help. Goal setting is one thing, but tracking your progress to ensure success is something else completely. That’s why it’s important to use social media analytics to figure out what’s moving the needle for your business. 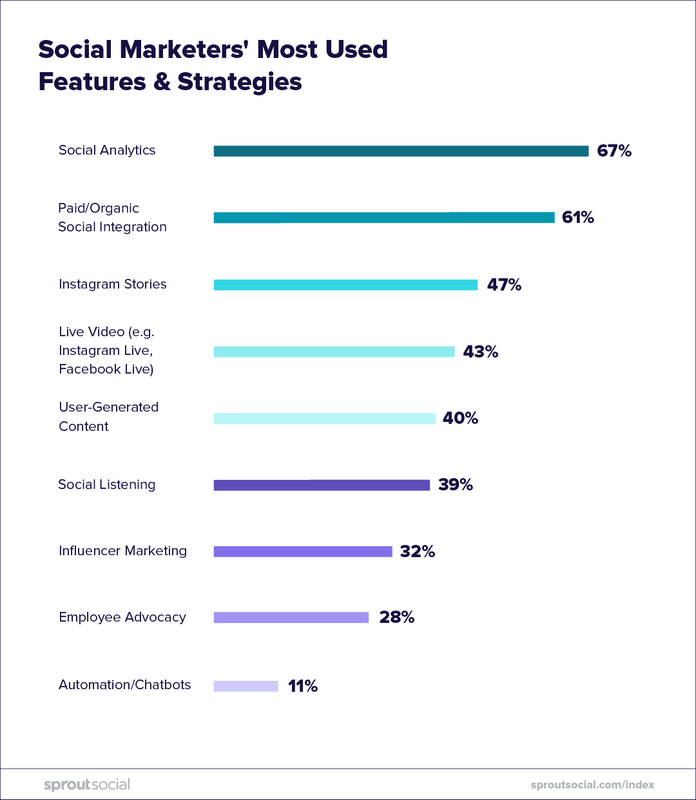 According to the most recent Sprout Social Index, social analytics is the most used social marketing feature and strategy. Native social media networks offer analytics on your social presence, but if you want to get deeper analysis, cross-network analysis, cross-profile analysis and more, you will need to invest in a social media management platform. Below are some of the most important metrics that you can track provided by the social networks. The number of times an individual saw your message. The number of engagements divided by the number of impressions. The number of times someone visited your profile page. The number of times your handle or brand was mentioned on social. The number of individuals who follow you on social, usually shown as an increase or decrease over time. 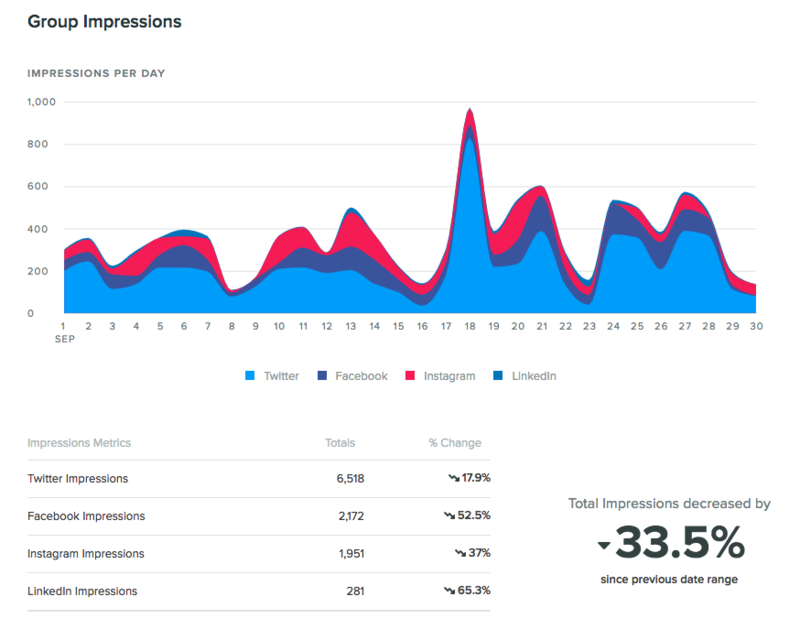 If you’re using a social media management and analytics tool you can dig into additional reports and analytics. Here are some of the reports our small business audiences like to run in Sprout. *Caveat:* This section includes reports from Sprout Social because I do work here. While there may be other solutions out there, Sprout Social is my favorite and the one I know most about. This is mostly just to show you what you can do with social tools. You can also run all these reports for totally free with no commitment if you start a Sprout Social trial. We do the heavy lifting to help you understand how responsive you are to messages that appear to warrant a response. You will see how effectively you’re responding to these messages (Response Rate) and how quickly you’re engaging (Response Time). Get a sense of how you rank among the pack. We calculate your percentile ranking by comparing your Response Rate and Response Time metrics for the selected period against the latest data that we have on profiles similar to yours. 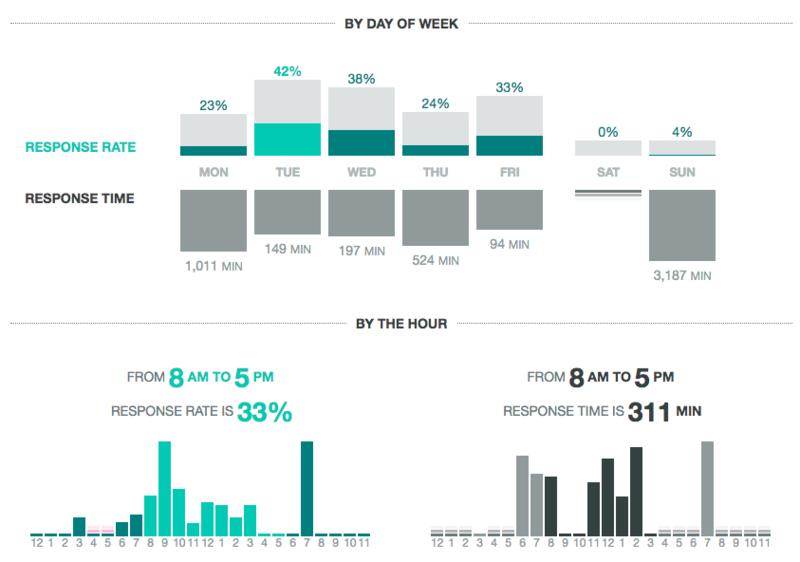 Dig deeper into your Engagement Report to see which days of the week or times of the day you’re least responsive and make sure you’re properly allocating time to your efforts. If you’re managing social media as a team, it’s important to dig into your team’s data to see who your top performers are and who could use a little coaching, especially across multiple locations. 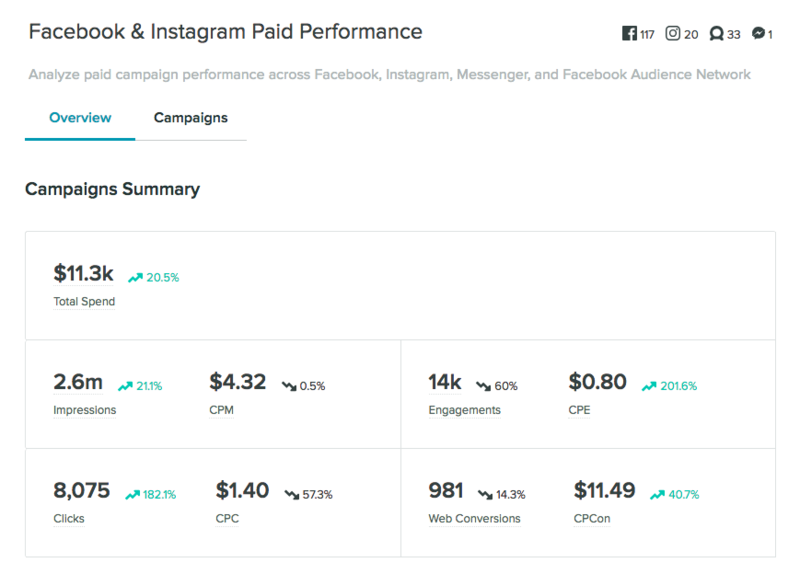 Get an at-a-glance look at how your paid social media efforts are performing from a single dashboard. 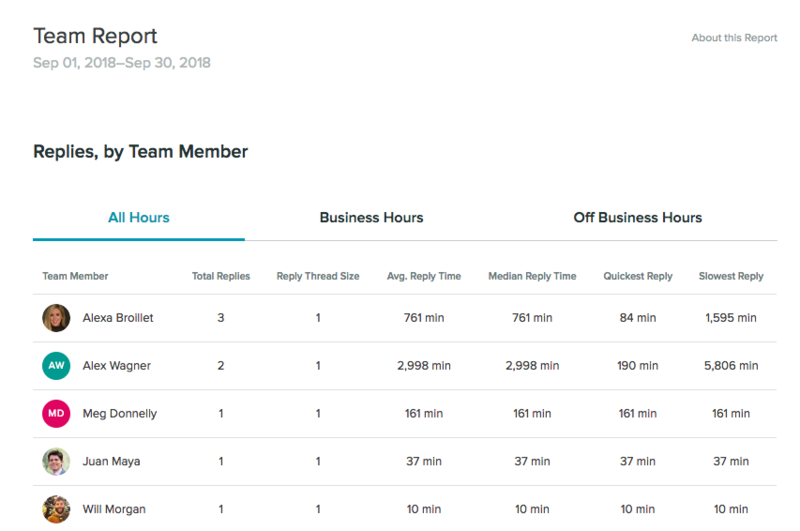 While most small businesses I talk to spend a lot of their reporting time exporting data from each social media network and profile, the Sprout Social Group Report aggregates that all into a single report so you can see how you’re performing on social as a whole. 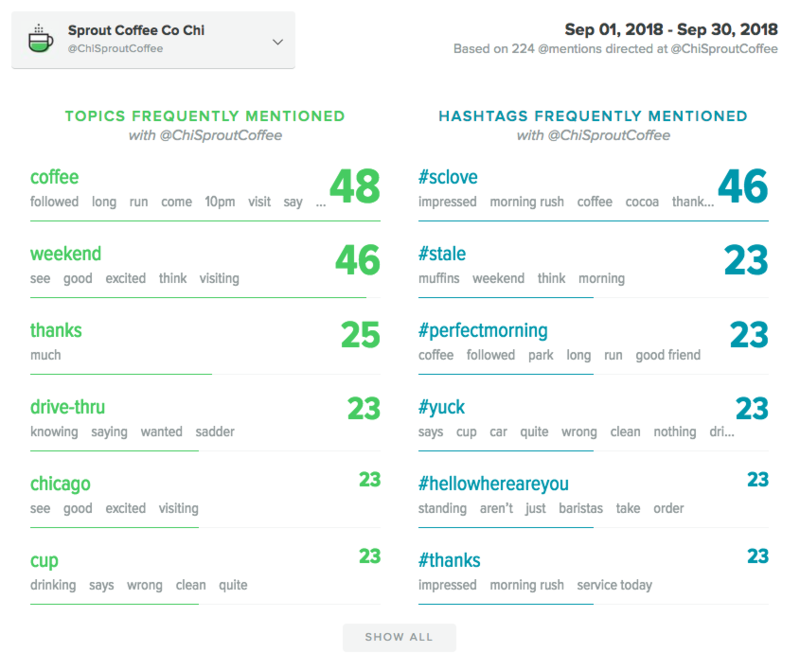 Figure out what topics and hashtags your brand is most frequently mentioned with, then you can use that information to create content you know your audience will like. Keep an eye on your competitors by running Competitive Comparisons. 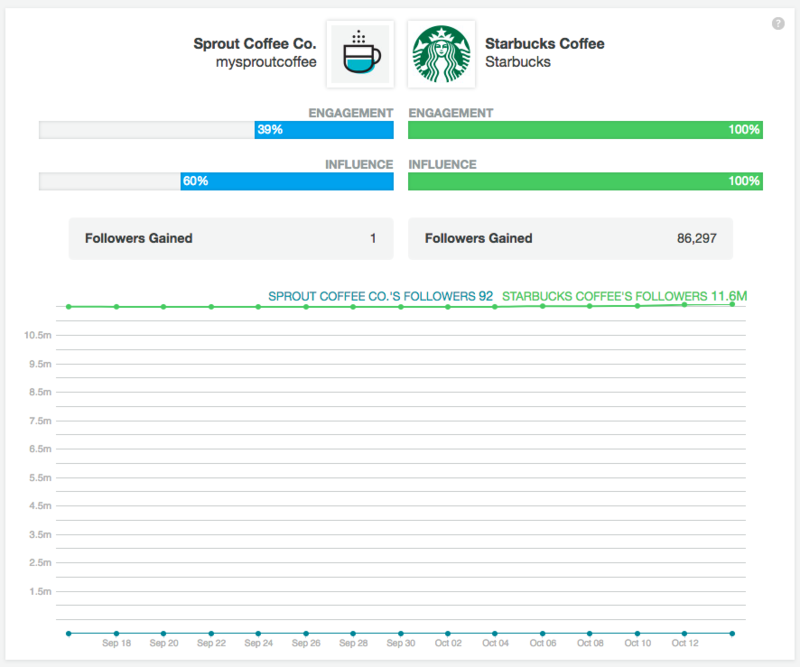 Unfortunately for our made-up coffee store below, Starbucks seems to be doing a better job on social. 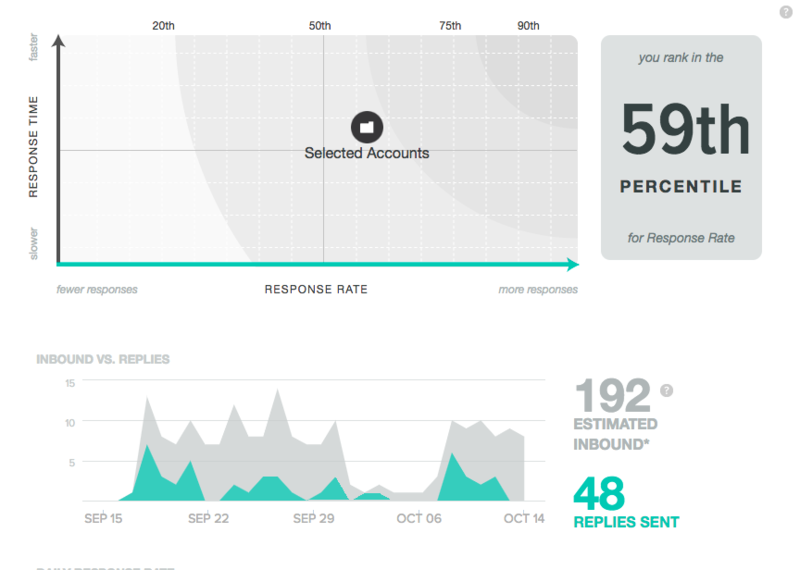 Those are just a few of the reports that you can run with Sprout Social. If you’d like to hear more about all of our reporting features and how they can help you achieve social success, just get in touch with our team! 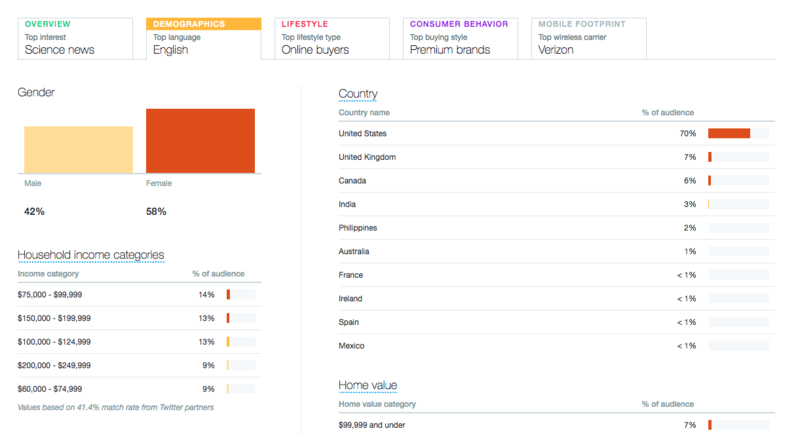 Social media analytics is the number one feature marketers are looking for. Let us show you how you can start to pull yours. Alright, up to now we’ve figured out why social media is valuable for your small business, how to set goals that will have an impact on your bottom line, and how to track those goals with social media analytics. Now let’s get into some of the more tactical stuff. Here are tips for smaller organizations ramping up their social media marketing. Most marketers will tell you the first step in creating a successful campaign is getting to know your audience, and the same rings true for social media. Though you may have an understanding of who your audience is there is social data you can pull to verify your understanding. Get a better understanding of who your social audience is by using data from social networks or a third-party social media tool. Below is a look at my personal audience demographics from Twitter. To access this data go to your Twitter page, click on your icon in the top right corner, click “Analytics” and go to the tab “Audiences”. This is a plethora of data that can help you identify who and where your audience is so you can create content you know they’ll enjoy. 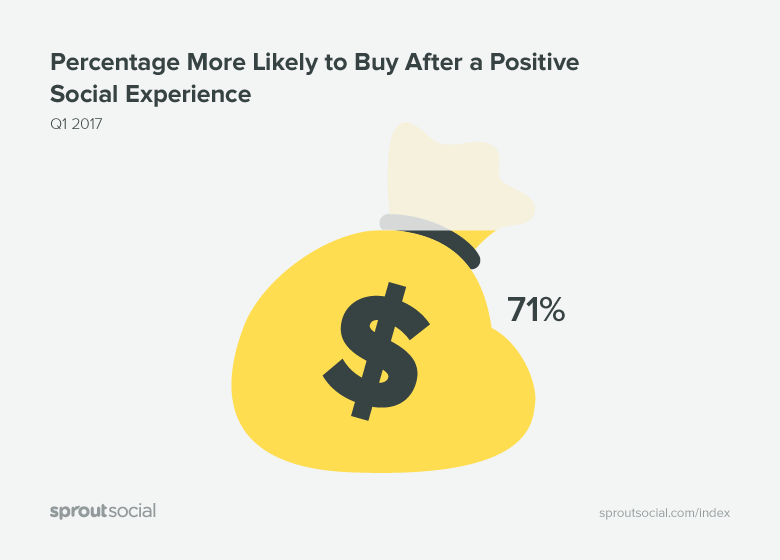 Remember the graph we shared above which showed customers are 71% more likely to purchase from a brand after a positive experience on social? That’s because engaging with your audience on social is critical. 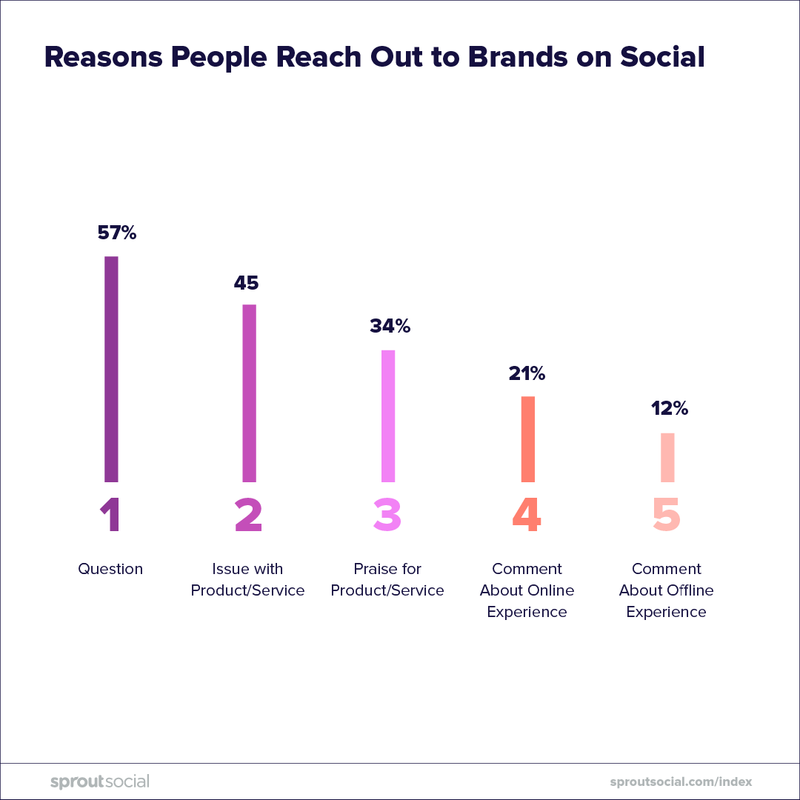 Customers reach out to you on social for a number of reasons, and our Sprout Social Index surveyed customers to ask why they’re reaching out to brands social. Reaching out to your customers to answer their questions in a timely fashion is essential to building a deeper relationship and selling more. Think about it this way: you wouldn’t ignore a customer calling your office phone, would you? This is probably my favorite tip and our customers light up when they first see the value. It’s possible to use a social media listening tool to find conversations happening on social media that are perfect for you to join. Let’s say that you run a pizza restaurant in Chicago that sells gluten-free pizza. 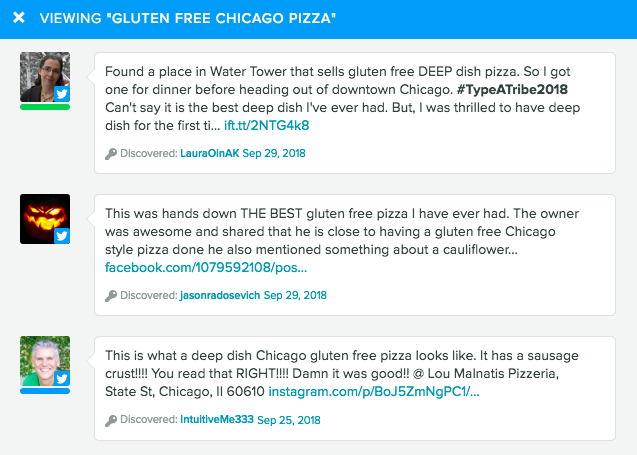 Within Sprout you can set a Brand Keyword that will constantly search social media for people who mention “gluten-free pizza” within a certain radius of your restaurant. Those messages will then be streamed to your Smart Inbox to interact with. There are a few things you can do to those who are mentioning gluten-free pizza. Give them a simple Like or Favorite. Chances are they will check out your page and see that you similarly offer gluten-free pizza and may put you on their list of places to try. Actively reach out to them. Acknowledge their original message in a way that shows you care about their opinion and even offer them a coupon code for the next time they’re in the market for your gluten-free deliciousness. It helps me be part of timely conversations that before I may have missed, especially on Twitter. It’s also really easy to say thank you to new followers and donors on social media, where before I may have missed it. If you’re not taking the time to plan your social media calendar in advance, you could end up scrambling to find content to share. This is a big problem because sharing quality content across your social channels is key to engage your audience and attract new followers. Below is a view of a healthy social content calendar with a month’s worth of content across several platforms. One questions we hear frequently is “what is the best time to post on social”, so we built an entire post with the times that work. But while that’s helpful it does create a problem: if everyone starts posting at that time, is it really then the best time to post? These types of studies come up very frequently and while they are fresh they’re an amazing resource to drive more engagement. But as they become more popular and more users post at those times, streams become flooded and messages get lost. That’s why it’s a good idea to publish at your optimal send times. You can do this by studying your social media sent messages and finding trends in when posts get top engagement, or you can use a tool like Sprout’s Optimal Send Times to do that for you automatically. I started using Optimal Send Times in June  right after it was rolled out and saw a huge increase in engagement and reach. While hashtags may seem a bit played out, and they’re frequently on the receiving end of jokes in media, they’re still critical for social media. Hashtags can increase your reach tremendously and even incentivize customers to Tweet when they normally wouldn’t have. Not sure which hashtags to use? One of my favorite tools is our Hashtag Holidays Calendar. 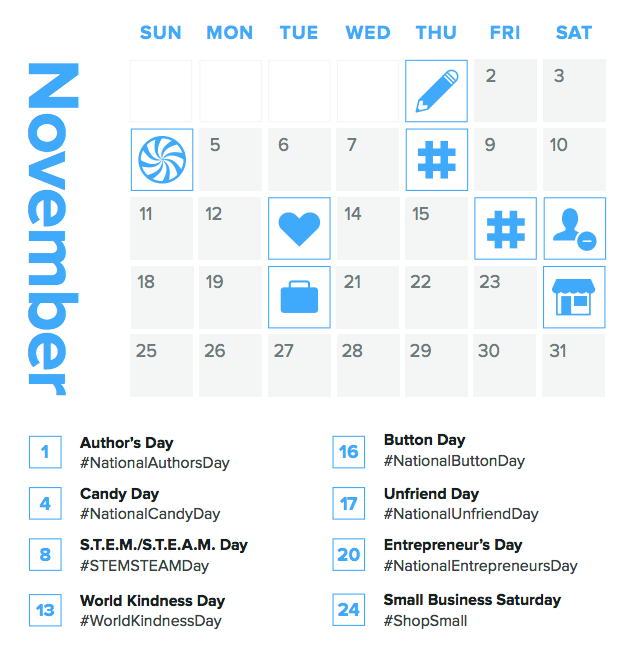 It’s a free resource that shows you all of the upcoming Hashtag Holidays, like Small Business Saturday (*cough November 24th*). Assuming the Hashtag Holiday makes sense to your brand, it’s a great way to inspire content while taking advantage of a trending topic. We’ve also created an article about finding hashtags if you need additional help. Whether you’ve been running your social media accounts for a while or have just been dabbling in social marketing it’s important to conduct an audit of your social presence. A social media audit will tell you what has worked, what hasn’t worked, what profiles need a bit of an update and so much more. To make it easier our team created a free social media audit template. We’ve put together a separate resource with 39 Free Tools to Create Social Media Images if you need something to help get your creativity flowing! And now it’s time for a braggy story. We all know how each social network requires differently sized imagery for posting, and if you don’t use the correct size your image may come out a bit distorted. That’s why I submitted an idea for a free tool called Landscape for our Sprout Social “Hack Week”, and we actually created and shipped the final product! Give it a whirl when you need to resize images. Video content is an amazing way to increase your engagement on social channels, but creating videos can be intimidating. Whether you don’t have the necessary supplies to shoot something quality, don’t have the proper location to film or have just a bit of stage-fright, it doesn’t have to be hard. We worked with the video marketing professionals at Wistia to create the guide “10 Tips for Creating Engaging Social Media Videos“, but here are the cliff notes. Base your video content off your objectives and goals. Video marketing is never one and done – make more! You don’t have to hire outside talent – you’re the talent! Write yourself a script – don’t wing it. Edit your videos for each social networks requirements. Optimize the messaging in each social post. Respond to all inbound video comments. Pay attention to the video analytics. Pair video analytics with social analytics. With so many tips already on this list you can run with organically, why should you consider paid ads? Well if your messages aren’t getting the impressions or views that you’d like then it is always possible to put a few paid dollars between them to give them a boost. Even just a few dollars can get you hundreds of new impressions for posts, and with Sprout Social’s Boost technology it has never been easier. Not sure what kind of ads to start making? We have some data for that as well. 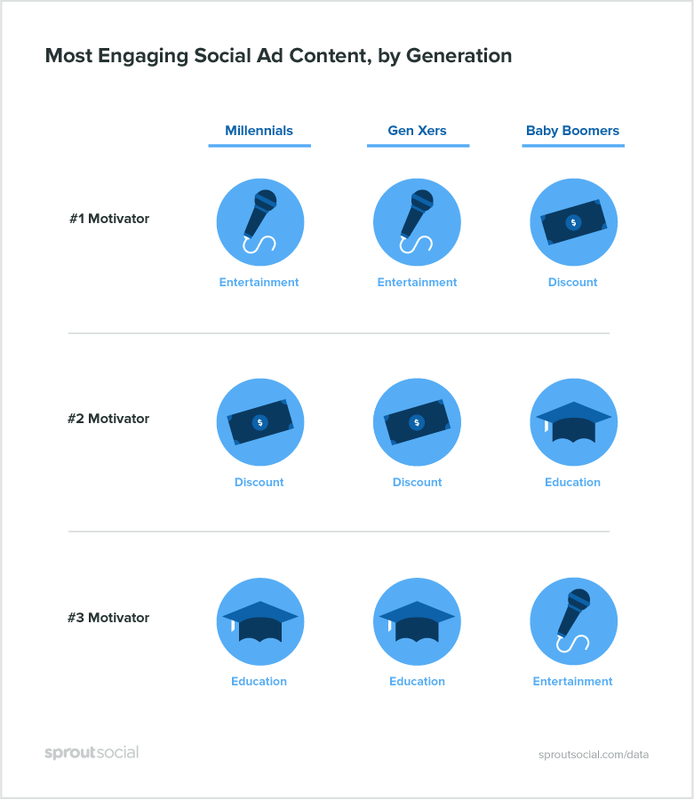 We even break down the most compelling content by the generation you may be selling to. There is no I in Tweet. Thinking as a social business team is important because social touches all facets of your organization, not just branding and awareness. From managing client relationships through your customer service and sales teams, to engaging audiences through your social and agency teams, to discovering new avenues for your product team, social plays a role in all ares of your organization. With a small business, efficiency is key for your social media marketing team. Make sure you’re building a team that is able to respond to your incoming messages without getting overwhelmed. Social media collaboration is key! Now that you have some stellar tips to improve your social media marketing let’s talk about some of the tools that can help you on the way! I work in marketing and the number of software tools I use every day to help me get things done is pretty immense. While some marketers may scoff at my “techstack” (the term most people refer to as all of the software in their toolbelt), it genuinely helps me save time and be more effective in my role. And if I wasn’t using software to keep up with my own work I would be drowning. Our customers certainly agree when it comes to using Sprout to help them manage their work. It’s definitely a time thing. If we weren’t using any kind of social media tool my workday would be a disaster. But here are a few people who are glad they’ went with Sprout. Social media management tools or native networks? This is one of the main questions I hear from small businesses who are looking into social media management software for the first time, and it’s very valid. At Sprout, we have deep relationships with all of the social media networks out there and their tools are fantastic. However, there are certain advantages to using a third-party-platform for your social marketing. Sprout Social helps nearly 10,000 small and medium-sized businesses build stronger relationships with customers and eliminate time-consuming tasks on social. Sprout Social isn’t just a provider, we’re a partner. When SMBs subscribe to Sprout Social they’re getting more than just a leading social media scheduling, analytics and management platform; they’re getting a partner that truly cares about helping them set and achieve social goals. 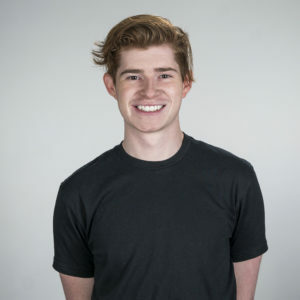 Our entire company is focused on helping your business create real connections on social media, and we’re happy to do it (check the 4.7 star Glassdoor review). Don’t you want to work with a company who is happy to work with you? Our brand isn’t our design, our products or our logo—our brand is how we make people feel. And customer support isn’t just a department or a job title, it’s our relationship with the people who allow us to do what we love. And I realize that it may seem a bit unfair to only quote our CEO, so here’s what one of our amazing customers had to say. I just really liked that you guys took the time to call me. You’re still taking the time to call me and it feels like I’m not just a number. And as you know I love sharing our customers quotes, so here’s another. Sprout has the highest ratings in satisfaction, support, usability and retention (per industry analysts and real user reviews). If you’ve never used a social media management platform before, or if you have and didn’t enjoy the experience, you know just how important it is to get setup properly and quickly. Especially when you have goals to hit and stakeholders to share value with. At Sprout Social, we’re here to help you with completely free onboarding to make sure you’re finding value fast. I really liked how the onboarding process was. I had 3 different phone calls with people to teach me how to use the tool. Oh yeah, there’s also me! I’m the Small to Medium Business Marketing Lead, and my job is to consistently create content that will not only help you find value with Sprout Social, but also give you the leading strategies and insights into the world of small business marketing. Here’s a look at the face behind the keyboard and my Twitter handle (DMs are open). Alright, yes we have a world class team, but that world-class team is also building and maintaining world-class social media management software. We all know how good it feels to hit “inbox zero”, right? 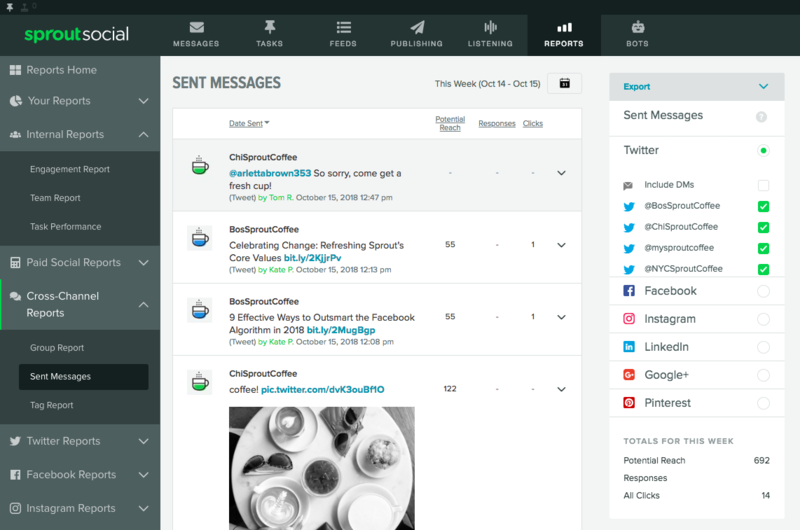 Well with an all in one inbox like Sprout’s Smart Inbox, you can stream every single message from all of your social media profiles into a single location, making it easy to respond to the social posts that need your attention. Then as you go through the Smart Inbox you can choose to Mark Messages Complete, removing it from your Smart Inbox entirely. It gives you the comfort of knowing every social message from your customers has been properly responded to. I can leave at the end of the day, or start the day knowing that I really haven’t overlooked anyone that has reached out for help or has said something really great about us that didn’t get a response. If you’re lucky enough to have a few accomplices helping you manage your social media messages then Sprout is a must. Sprout allows for publishing for all social profiles from a single location. Easily schedule content and use advanced posting capabilities to ensure it reaches the right people at optimal times. 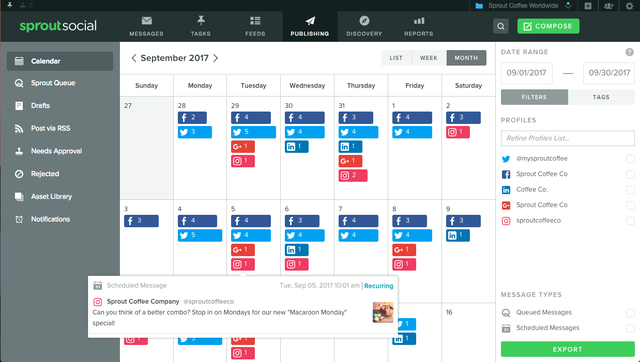 Post messages to all of your social media networks and profiles at a single time with Sprout’s scheduler. You can also tag individual messages to later report on the success of specific campaigns. A visual social content calendar makes it easy to see what your upcoming social schedule looks like. If you see a few days with too many or too few posts scheduled then simply shift those messages around to ensure you always have great content to share. Not sure when the best time is to send messages to your audience? Sprout’s ViralPost and Optimal Send Times will use data to figure out the times your audience is most engaged and automatically publish those posts even if you’re not at your computer. Create a repository of pre-approved images to make it easy to find visuals to share with your messages. You can also edit images right from the Sprout Image Editor to make it even more personal to your messages. Sprout’s reporting functionality simplifies the measurement of performance metrics, including audience growth and interactions, team performance, competitive analysis and much more. I really do like Sprout’s Reporting features. They’re very user-friendly, comprehensive and easy-to-read. I can give them to my boss and they understand our engagement points as well. Create custom social reports based on the data most important to your team, then easily export those presentation-ready reports to share. Would you rather dig into the numbers yourself? No problem–download your numbers as a CSV and work your excel magic to make the data your own. Optimized workflows and user-friendly interfaces, including a content calendar and post-scheduling features. Centralized views of all social media channels and profiles, featuring real-time keyword and hashtag monitoring. Instant analysis of social performance through customizable reporting, at both a profile and post level. My productivity was significantly lower before Sprout Social. Before I could maybe post once to each profile natively per day, but now we post 2-3 times a day from each profile on all platforms. We have an entire team of professional Account Executives, Solutions Engineers, Marketers and Strategists all here to help you find value on social media. Just fill out the information below and we’ll be in touch! Prove the value of social media for Small Business with Sprout Social’s simple yet powerful social media management platform, and combine your social data with our company’s strategic knowledge to grow your presence, team and business. Still looking for more information on social media marketing for small business? Check out this infographic!